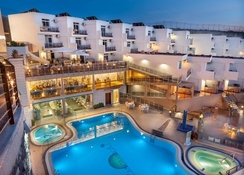 The Kn Panoramica Aparthotel is a budget-friendly hilltop apartment located in Torviscas Alto. The modern and trendy complex offers all-inclusive, half-board, bed and breakfast and self-catering accommodations in its stylish and elegantly furnished guestrooms. The apartment hotel is a perfect place to spend a relaxed holiday among beautifully landscaped banana plantation overlooking Atlantic Ocean. Chill out at the adult-only outdoor swimming pool and at the same time send your kids to the children’s pool, where they can have ultimate fun under the supervision of the hotel’s staff members. Guests who want to relax and rejuvenate their senses can make use of the spa, where you will also find a thermal circuit, Turkish bath, sauna, Jacuzzi and a relaxation area. 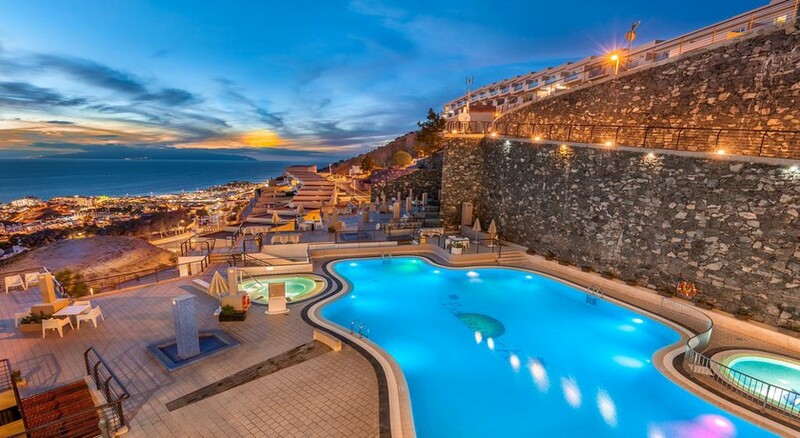 Situated about 18.1km from the Tenerife South Airport, the Kn Panoramica Aparthotel is nestled between Atlantic Ocean and kilometres long land covered with banana trees. The nearest beach is about 2.5km from the property. 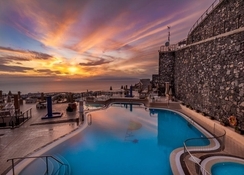 Siam Park (3km), Puerto Colon (3km), Gran Sur Shopping Centre (1km), Magma Art and Congress Centre (3km), Magma Playa de la Americas (3km) are a few places nearby worth visiting. 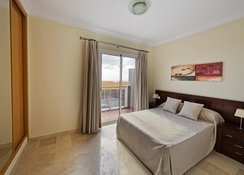 The complex features luxurious immaculately decorated apartments divided into studio and Apartment. All guestrooms are dressed with double or twin beds, air conditioning, sofa, satellite television, telephone, closets and an attached bathroom with a whirlpool bath. Wireless internet can be accessed without charges. A separate kitchen is fitted with cooking hob, refrigerator, microwave, crockery and kitchenware. 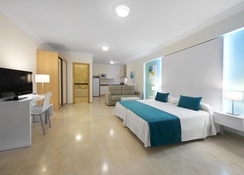 All guestrooms are tastefully decorated with modern and comfortable furnishings, working station, balcony or terrace with ocean or landscape view. The complex houses a buffet restaurant named Guayota Restaurant that serves breakfast, lunch and dinner. The restaurant is set aside the pool and has magnificent views of Atlantic as well as landscape around the property. The cuisine served is a myriad of flavours from both local and international variations along with light food. Other than this, there is a snack bar, which can be found near the pool area, it serves a range of snack and refreshing drinks according to your preference. Or take advantage of the in-room food and drink service to make yourself comfortable. In addition, there are numerous bars and restaurants available in the vicinity serving large variety of food. The complex features an outdoor swimming pool and a sun terrace with loungers. 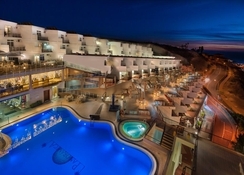 Other facilities include table tennis, solarium and spa with body massages, beauty treatments, Jacuzzi and whirlpool. There is a minimarket available on site for your daily needs. 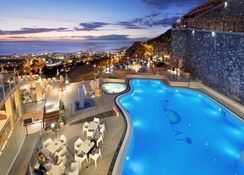 You can also rent a car or a bicycle from the reception and take a tour of the beautiful Tenerife Island. Those who want to stay in shape can take advantage of the fully-fledged gym. Effective April 01st, 2019 - Government Levy is adjust from US$ 5.50 to US$ 9.63, per bedroom, per night. Amazing hotel, great facilities, beautiful sunsets, but be prepared to walk. It's a good 30+ mins downhill to the resort and well, uphill at the end of the day - fuggedabadit! Fab apartments, we had 3 bedrooms and the 4th in an open plan kitchen /living area on the floor below with separate toilet and leading out to a private yard. Staff wonderful and very efficient, coming to the apartment quickly on 2 occasions when we required minor repair to window lock. The balconies are fantastic with amazing views. Quite a walk to the resort centre and nothing very close by way of entertainment but taxis were swift and cheap. Pool was clean and plenty of room, shop on site was excellent. Ate at the pool a few times, very reasonable and very good standard.